It doesn’t matter if you ride a road bike, mountain bike, ebike, or motorcycle, a good helmet is vital to staying safe. But in this day and age, even the simple helmet is getting a high-tech makeover, with all kinds of smart elements being added. Once the stuff of science fiction, smart helmets are now a very real product, bringing built-in microphones, speakers, rear-facing cameras, and many other helpful features with them. The best smart helmets combine several of these gizmos to make your riding experience safer and more enjoyable. Helmets may still be the bane of many a haircut but they remain a crucial part of any rider’s wardrobe. Here, we’ve scoured the market to find the coolest helmets and accessories, all of which are available now or are currently in development. Whether you ride a bicycle or a motorcycle, read on to see if any of them might be a good fit for you. Note: Several of these items are currently only available via crowdfunding websites such as Kickstarter and Indiegogo. Investing in these types of projects can be a risk, and there’s no guarantee that you’ll end up receiving anything. We make no guarantees, as we are not affiliated with any of these companies. The Livall Bling BH60 has been a staple on the list of best smart helmets for years — and it’s for good reason. With its built-in LED strips on the top and rear — which can be controlled using a remote affixed to the handlebars — riders are not only more visible, but they can indicate which direction they’re turning, too. The helmet also works with the official Livall app (iOS/Android) to issue automatic SOS impact alerts should the wearer fall or be struck by a car. In those situations, the app automatically alerts the rider’s emergency contact to inform them of the incident. A windbreak microphone and Bluetooth speaker even allow for hands-free calling and playback of music, as well. There’s also a walkie-talkie feature which allows riders to stay in contact with other Bling users in their group while on the trail or road. If the Bling BH60 isn’t to your liking, Livall offers an array of other helmets that feature different designs, but offer the same set of features and technology. For instance, the company’s Bling MT1 was specifically made with mountain bikers in mind. There are even smart helmet options for kids, too. This helmet is also water-resistant, allowing it to survive unexpected rain showers — or expected, if that’s how you like to ride. If you’re only biking to and from work, it may not be the best choice due mainly to the fact the lights aren’t particularly visible during daytime. However, it’s still stylish, affordable, and offers plenty of protection to go along with its smart features. Many cyclists enjoy listening to music while riding, but that can be a dangerous habit, especially when traversing high-density urban areas with lots of traffic. Coros overcomes this issue by creating smart cycling helmets which allow for safe listening by using bone conduction speakers to transfer sound directly through your ear bones (weird, right?). The result is a decent listening experience that doesn’t prevent the rider from being able to hear the environment around them. The included smart remote and mount snaps easily onto your handlebars and can control volume, playback, and phone calls, while the inclusion of a wind-resistant precision microphone means you can have conversations on-the-go. Like the Livall Bling, there’s also an onboard impact sensor that automatically notifies emergency contacts in the event of a collision. The Omni is a nice upgrade over the brand’s previous release, the Linx, adding LED lights for better visibility and compatibility with the more robust Coros app (iOS/Android). 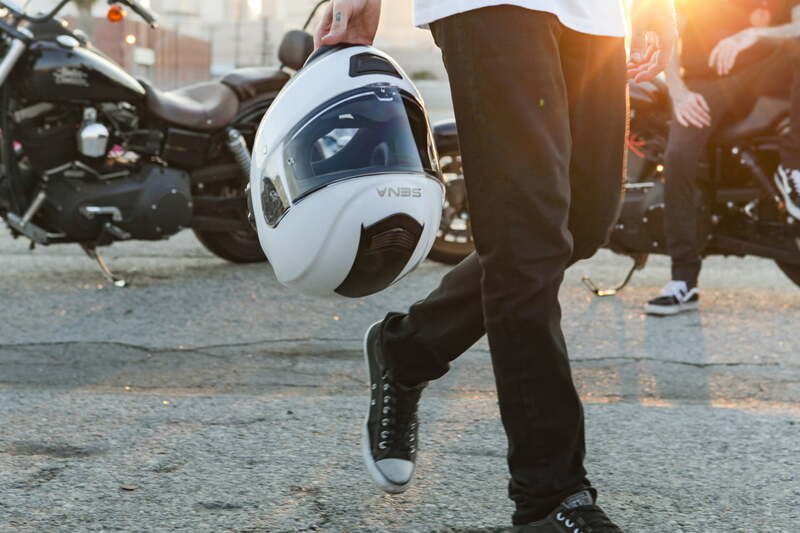 Whether you pedal your bike or fire up its engine, Sena has a smart helmet for you. The company makes noggin protection for both cyclists and bikers, both of which come packed with some seriously innovative technology. The Momentum is Sena’s flagship motorcycle helmet, while the X1 is its top cycling option, with both sporting Bluetooth connectivity via a smartphone to offer the ability to listen to music, take phone calls, receive GPS navigation instructions, and more. Both helmets are also equipped with onboard video cameras, FM radios, and an intercom system that allows hands-free communication with other riders. Built for cycling, skateboarding, climbing, or just about any other outdoor activity where a helmet may be required, the Airwheel C5 packs a lot of features into a relatively lightweight and good-looking design. Not only does this helmet allow the wearer to take phone calls completely handsfree, its onboard Bluetooth speaker can facilitate music and podcast playback, as well. Best of all, the C5 features an onboard 2K high-def camera for recording video and taking photos and comes with 128 GB of built-in storage. Its rechargeable battery provides up to three hours of recording time, while integrated WiFi connectivity makes it a breeze to upload any video or images to another device for editing. Airwheel even put thought into the helmet’s ventilation system, making it comfortable to wear for extended periods of time. Helmet-mounted displays will eventually be like flat screens — once cutting edge tech that has now become commonplace. Once projection and smart technologies become easier to manage, head-up displays are likely to be everywhere. Livemap is a prototype motorcycle helmet that uses augmented reality for navigation; street names, speed, and turn-by-turn directions are displayed directly over the world around you, negating the need to shift focus from the road. Slow to a stop and you can pop up a map to give it a more thorough examination. The helmet also includes a microphone and speakers for voice control, phone calls, and listening to music. The catch? It’s not available yet and it costs a fortune. You can reserve one now for a $500 deposit, though we’re not sure when it’ll actually launch. The company says that it is coming in 2018, but the device has already been delayed. For now, check out the Livemap website (you can still contribute to the project) to stay up to date on developments. The helmet’s software is based on the Android platform, so perhaps developers will eventually be able to build apps specifically for Livemap. The Cross Helmet X1 is easily the coolest (and most futuristic) looking helmet on our list, allowing riders to look like an action hero and, potentially ride like one too. Advertised as a “next-generation helmet,” the X1 will feature sound control, Bluetooth connectivity, a dedicated smartphone app, and — wait for it — a 360-degree range of vision, which is achieved via a rear camera displayed at the top of the visor, complete with a digital clock and navigational data. In combination with the wide-view visor, riders will be able to see the entire road, making the X1 one of the safest helmets ever built – assuming it works as intended of course. The app controls noise isolation, too, making it possible to block out the sound of traffic or open your ears when cruising through more serene environments. Additional features like group talk functionality and safety lighting will only make the X1 more attractive when it starts shipping in 2019. Another high-tech motorcycle helmet scheduled for release in 2018 is the Skully Fenix AR. This device features a head-up display in the form of a small, integrated screen that not only offers turn-by-turn navigational cues but provides 360-degree awareness thanks to a rear-facing camera built-into the back of the helmet. Music streaming and handsfree phone calls are also part of the package, as well. Made from a carbon fiber shell, the Fenix AR promises to be lightweight and comfortable to wear. It includes a visor that resists fogging, emergency quick-release straps, a chin skirt, and is available in six sixes. Preorders are being taken now, with a promised delivery date of summer in the United States and Canada, with European models coming later. By now, we can probably all agree: Smart helmets are awesome. What’s not awesome is spending tons of money to replace your favorite domepiece with a high-tech head-cage that may or may not fit comfortably. Ahead, a Samsung-funded Kickstarter project led by a group called Analogue Plus, looks to remedy that problem. It’s a little device that affixes to an existing helmet — a variety of different mounts are included, so most any helmet is compatible — and utilizes an oscillator to conduct sound through the helmet and into your ears. Connecting Ahead to your smartphone via the dedicated app allows users to listen to music, make phone calls, activate your digital assistant, and track various fitness metrics, among other things. Dual narrow-angle microphones on either side of the device also ensure that ambient noise is eliminated, even at speeds up to 40 miles per hour. Plus, it’s durable and IP45 rated for water and dust, so it should survive most rides, even in inclement conditions. Lightmode is an attachment designed to work with any motorcycle helmet. This is more decorative than “smart” technology. Perfect for Tron cosplay, you merely have to glue these lights on with the provided two-part adhesive to ensure they hold at high speeds. A flexible sticky mount holds a tiny controller for the lights, the latter of which last up to 13 hours on two AA batteries and features three modes (constant, slow blink, and fast blink). Lightmode also comes in three kit sizes, with the larger Proton kit affording you about 15 feet of piping in one of seven colors. The company crushed its initial Kickstarter campaign in 2014 and has since upgraded all of its options with a new, more efficient, controller. The kits are available in an array of different colors and options for variety of helmet types, with prices starting at $129. The BE-Link is another Kickstarter project and though it isn’t a smart helmet per se, it is a convenient add-on that delivers some smart features. The BE-Link is essentially a pair of wired headphones that can be installed in any helmet with a die-cut Velcro cradle or the dedicated BE-Link Cradle mount ($15). One of those two options works with pretty much every helmet on the market, which means you can add Bluetooth to your rig, or quickly transfer it between different helmets as needed. And, since you’re supposed to replace your bike helmet every three years, this could save you a few bucks in the long run. Prior to closing its doors in April of 2017, the San Francisco-based startup Skully was in the process of developing the AR-1, a crazy smart motorcycle helmet that looked every bit of a game changer. The helmet, which raised more than $2 million in funding via Indiegogo, featured an integrated heads-up display which projected a live feed from the helmet’s rearview camera onto the inside of an electrochromic visor. The helmet also supported Bluetooth, allowing you to take phone calls and listen to music sans cables. Skully did actually ship some units to a few fortunate riders but after funding grew thin and founder Marcus Weller was unable to close a deal with Chinese company LeSports, the venture (unfortunately) collapsed. Do they have snowy mountains in Australia? Turns out, the answer is yes. So, Sydney-based startup Forcite created a smart snow helmet dubbed the Alpine, tricked it out with tons of cool features, then took it to Kickstarter. The Alpine is outfitted with a 4K action cam (with image stabilization and slow-mo capabilities), a helmet-to-helmet walkie-talkie, fog lights, and a smattering of useful sensors, including an altimeter and an impact sensor. The Forcite team was seeking $200,000 and ended up roughly 75 percent of the way to its funding goal. Often, companies modify their product (and their goal) and start another round of funding. This doesn’t seem to be the case with the Alpine, however, which sort of fell off the face of the Earth after it canceled funding in October of 2015. At $800, the Alpine wasn’t going to be cheap but it’s still disappointing to see it fall by the wayside.